Need some inspiration for a worthwhile New Year’s Resolution that you might actually keep? Here are a few recommended resolutions that will act as investments in both your short and long term health. Sit Less New studies showing just how bad sitting is for your health are starting to really convince us that a lifestyle change is in order. Limit your sitting to four hours a day, set an alarm to remind you to get up every hour or invest in a standing workstation. Any way you can find to do it, this is one great investment in your long term health. Too many of us fail to stick to an exercise program because we don’t choose the right activity. The gym isn’t your only option. This year, try to find an activity that you really enjoy. It can be anything from laser tag, to dancing, to rock climbing. It doesn’t matter what the activity is as long as it gets you moving. Are you getting your recommended eight cups a day? If not, this is an easy resolution to keep that can make a surprising difference to your overall wellbeing. Staying hydrated has been shown to help with concentration, fatigue and even reducing pain. You might feel a bit self-indulgent if you visit a Physio for a problem that really hasn’t been bothering you much. However, most chronic health problems start out as something small. They are also much easier to treat in the early stages. Invest in your body now and treat pain before it does get in the way of your day to day activity levels. Pelvic floor weakness is a common problem that affects both men and women, often resulting in incontinence and pain. The good news is that most pelvic floor disorders can be treated with specific exercises. Unfortunately, many people actually do these exercises the wrong way, making the problem worse. 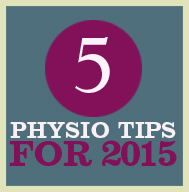 Speak to your physiotherapist to find out how they can help ensure you have correct technique.